Wickenburg, Arizona has had a very interesting history. In this article, we will go over four major events that made Wickenburg what it is today. These four events are the discovery of the Vulture Gold Mine, the Wickenburg Massacre, the Walnut Grove Dam disaster and the founding of the Dude Ranches. The Vulture Mine was founded by Henry Wickenburg, an Australian immigrant. Wickenburg helped Pauline Weaver discover Rich Hill in 1963. Later, he followed a friend’s advice and set out in search of gold west of the Hassayampa. In 1864, he established what would become the richest gold mine in Arizona. By 1870, a boomtown named after Wickenburg developed, and the population of Maricopa County was 500 people. This town is believed to help start the development of Phoenix. An adobe jail was established, however, inmates were able to dig their way out. To solve this problem, a large mesquite tree at Tegner and Center was used to hold outlaws. 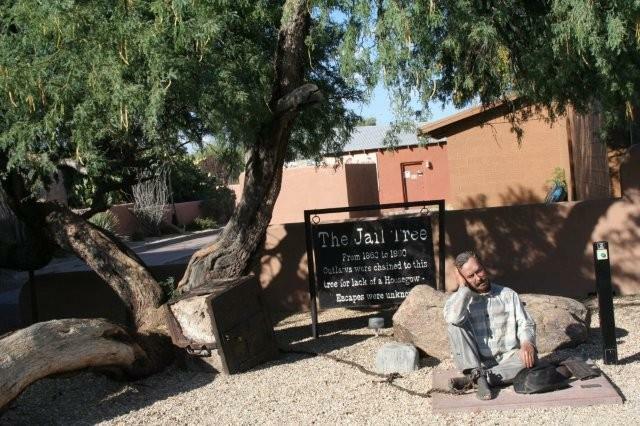 They were chained to this Jail tree until they sobered up or served their time. The Wickenburg Massacre, which happened on November 4, 1871, occurred when a stagecoach was attacked. This stage was only 9 miles out of Wickenburg and was heading for Ehrenberg. The driver and five passengers were killed by immediate gunfire. Two people, Mollie Shepherd (who happened to be carrying $40,000), and an army paymaster, William Kruger survived. Both of the survivors sustained some physical wounds but told different stories of the attack. Kruger had claimed it was Apache Indians but the bullets found did not say so. Indians were again ruled out when horses, clothing, and other things were left at the massacre scene. It is believed that the attackers were either Mexican bandits (who were known to ride through this area) or white men dressed as Indians, to mislead the victims. While General Crook investigated the attack, he nearly died while talking to the Hualapai Indians on their reservation. Later on, people began to suspect that Shepherd and Kruger were the attackers. They had been spending time with each other before the attack and left for California together. In California, they received star status in the newspapers. To this day, the Wickenburg Massacre remains an unsolved mystery. Placer gold north of Wickenburg was becoming quite the industry. However, water was in short supply. In order to solve this, Wells and DeWitt Bates, owners of a small mine, decided to make a dam to hold back water. Construction began in 1886 and the dam was completed in 1887. Another benefit of the dam was to provide irrigation water for nearby farms. The dam was built out of small rocks in a somewhat creative design. However, carelessness proved to be fatal later on. A spillway was constructed to divert overflowing water around the dam, but if it went over, would destroy the dam. The spillway was designed to be 55 feet wide by 12 feet deep. However, in order to cut down on costs, the spillway was only 15 feet wide by 8 feet deep. On February 18, 1890, the Bradshaw Mountains received heavy rain and an abnormally large runoff. Water was rising at 18 inches per hour according to one website. With the spillways blocked (dynamite couldn’t even clear them) and the water still rising, water began flowing over the dam on February 21st. The superintendent of the dam tried everything he could and as a last resort, sent Dan Burke down the Hassayampa. This Arizona version of Paul Revere was supposed to warn people downstream that the dam was about to break, however, he was distracted by Bob Brow’s Saloon. While Burke was drinking away, Brown sent out William Akard to relay the message. However, he never made the trip. At 2:00 a.m. on February 21, 1890 the dam broke. As a huge wall of water roared downstream at 80 feet tall and 60 miles per hour, many lost their lives and/or property. At Box Canyon, the water was over 80 feet tall and in Wickenburg, it was still over 40 feet tall. Witnesses in Buckeye said that the water was over two miles wide when the water reached the Gila River. About 100 people died during this huge disaster, which is considered one of the largest volumes of water in a United States dam failure. Losses included Bob Brow’s Saloon (and the $7,000 in the safe) along with Henry Wickenburg’s farm and many others property. Many tried to sue the company, however the lawsuits were dismissed. In the mid 1920’s, Wickenburg, Arizona was known as “the dude ranch capital of the world.” The Dude ranch was a vacation concept developed by Jack Burden and Romaine Lowdermilk. Guests came, and still do come from all over to visit these dude ranches in order to get a unique Wild West experience. Wickenburg still has numerous dude ranches to visit. Rogers, Scott. "The Walnut Grove Dam." wickenburg-az.com. N.p., June 1, 2009. Web. 4 Aug 2010. <http://www.wickenburg-az.com/2009/06/the-walnut-grove-dam/>. Trimble, Marshall. Roadside History of Arizona. 2nd edition. Missoula, Montana: Mountain Press Publishing Company, 2004. 430-437. Print.